Last week, I talked about the continuing attempts to settle the Ohio Valley. At the same time that longstanding political fight raged, another continuing land dispute flared up in New England. Now before I get into the details, I want to say that I thought most of the history on this topic of land disputes between New Hampshire and New York seemed to paint New York as the bad guy. Thinking that there was probably more gray area than that, and that since the New York parties became Tories during the Revolution, I tried to see if there really was more blame to go around on both sides. But the more I read about this, I came to the same conclusion as most other historians. The New Hampshire land owners certainly were not saints, and were not afraid to use violence, and perhaps the New Hampshire Governor was out of line in issuing the original grants. But New York, mostly out of corruption or contempt, seems to bear the responsibility for events getting out of control. 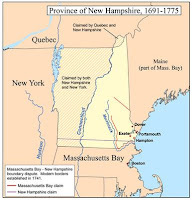 I mentioned almost in passing way back in Episode 18 that New Hampshire governor Benning Wentworth had been issuing land grants in the early 1760’s to lands he claimed were in the western part of the colony. Wentworth argued that the western border of New Hampshire started up around the same point as the western border of Massachusetts, about 20 miles west of the Connecticut River. The Governor had begun issuing land grants as early as 1749 beginning with a town he named after himself, Bennington. He really got going after the French and Indian War ended in 1760, and set up over 100 towns west of the Connecticut River. In each town, Gov. Wentworth received a small portion of the land as his personal property, thus giving him great financial incentive to encourage these settlements. In fact, there was no good documentation on what New Hampshire’s western border was. New York claimed it held all the land on the western side of the river. In the early 1760’s, new York’s colonial government started paying attention to all these New Englanders settling in eastern New York and claiming it was part of New Hampshire. In fact, they did more than pay attention. Acting NY Gov. Coldon started selling land patents to this land, giving the New York owner a legal claim to land that others already claimed under New Hampshire grants. As was often the case, London had at different times issued vague and sometimes contradictory instructions about colonial borders. Therefore, both New Hampshire and New York argued they had valid claims to this land. New York sent lobbyists to London to secure its claims. They assured the Privy Council that they had already settled the land and that New Yorkers were living happily all over the region. Without bothering to confirm any of this, the Privy Council ruled in 1764 that the land was in fact, part of New York. The Privy Council is a group of advisers to the King. The King appoints the members of the Council who serve at his pleasure. Typically, during the reign of George III. The Council included members of the Cabinet, other top political officials, as well as leaders of the Church of England and anyone else the King cared to include. The Council acted as an advisory committee for the King on matters requiring his action. But on most issues the King went along with the Council’s recommendations. Certainly, a minor legal land claim between two colonies based on interpretations of old land charters was probably not something that drew the King’s great interest. The Council had lawyers look at the claims, took their recommendation to the King who assented to the Council’s decision. The Council would then issue its orders in the name of the King. 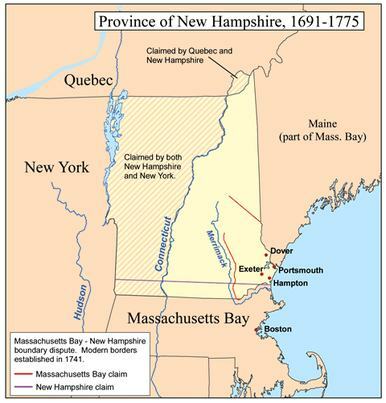 His Majesty doth order and declare the western banks of the River Connecticut, from where it enters the Province of the Massachusetts Bay, as far north as the forty-fifth degree of northern latitude, to be the boundary line between the said two Provinces of New Hampshire and New York. In getting this ruling, what New York did not stress to the Privy Council was that there were thousands of people with New Hampshire claims already living on this land. After receiving the Privy Council’s ruling, Gov. Wentworth stopped granting land patents, but no one seemed quite sure what the legal status was of all the people already living there, on land they had purchased from New Hampshire. Although New York had sold some land patents in the same area, most were to speculators who had not attempted to settle there. The residents, already living on land they had purchased and in towns they had built, asserted that their property remained their property - whether it was now part of New Hampshire or New York. The Governor of New Hampshire was the King’s lawful representative in the colonies and had sold them the land for good money. The fact that King through the Privy Council was adjusting colonial borders may have impacted who they would pay taxes to in future, but it would not impact private property ownership of the land. New York, however, took the Privy Council’s decision to mean that all of the New Hampshire grants were invalid and that it was open season on selling all the land in the region. The owners with New Hampshire land patents would either have to repurchase the land from New York or leave. Acting NY Gov. Coldon saw an opportunity to make some quick money through massive land grants to New Yorkers before London sent a new permanent Governor. 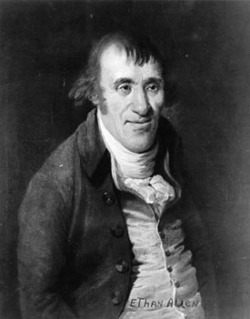 Once the new Governor, Henry Moore, arrived in late 1765, he too began issuing patents, though he was slowed up for a time because the Stamp Act controversy prevented him from issuing land patents without Stamps. When New York surveyors and others began checking out their new purchases, the New Hampshire land owners, accepting the fact that the King had declared they were living in New York, turned to the New York courts to validate their land claims. New York Courts backed up New York claimants by refusing to allow any evidence of New Hampshire grants as proof that a landowner actually owned his property. Without a New York grant, the claimant was deemed an illegal squatter. Unable to get New York courts to validate their land claims and seeing NY issue claims that conflicted with theirs, the settlers with New Hampshire land grants organized town meetings and in 1766 sent a lobbyist and a petition to the Privy Council to validate their claims. The Privy Council seemed to accept the settlers’ view, or at least sought to prevent any more conflicting land patents until it could reach a final decision. The Council, through Secretary of State Hillsborough, issued instructions to the new Governor of New York, Henry Moore not to issue any more land patents in the disputed territory, that is the 20 miles along the west bank of the Connecticut River. Gov. Moore received this instructions in late 1767, putting a stop to new land patents. But since New York had spent the three years prior issuing patents for much of this territory, the damage was already done. Things remained relatively quiet for a couple of years, with nothing really getting settled. Then, in 1769, NY Gov. Moore died rather suddenly, putting Lt. Gov. Colden back in charge once again. Colden, eager to get more money from land patents, decided to take a more creative interpretation of the Privy Council’s instructions. Most people had understood the orders to mean New York should not issue any land patents in the region. Colden decided the orders simply meant that the specific lands granted by New Hampshire were off limits but the other land in the territory, not specifically granted to a private party already, could be sold to others. In doing this, Colden also did not seem to pay much attention to what lands were actually already sold to private parties from New Hampshire and issued a bunch more conflicting claims anyway. Owners of the Grants now found themselves living without any protection from New Hampshire, and with a government in New York ready to confiscate their property. London seemed to be no help in issuing a firm edict that they owned their land under their New Hampshire grants. New York courts would not recognize them. So legal and political options did not seem to be available. Locals, however, were hardy frontiersmen who were not going to let a bunch of lawyers and bureaucrats take away their land. They formed local militias ready to defend their property against any attempts to seize it. One of the largest militia groups, in Bennington led by Seth Warner, Remember Baker, and Ira Allen organized to prevent anyone from acting on any New York land claims. In October 1769 a New York Sheriff arrived with land surveyors to subdivide a farm claimed under the New Hampshire grants. Local militia under arms forced the retreat of the New Yorkers out of the area. 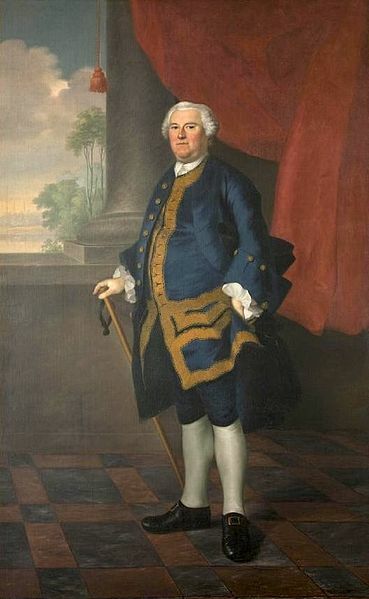 Around this same time, Ira Allen’s brother Ethan, who had been a resident of Connecticut and Massachusetts, purchased property in the disputed territory. His property claims originated from New Hampshire grants, meaning New York refused to recognize his claims. Allen knew the lands he purchased were in conflict with a New York claim, which is probably why he was able to buy 1000 acres of land for just £12. Ethan Allen took his land claims to a New York Court. The three judge panel that heard his case consisted of judges who either owned disputed land under New York patents, or had close friends and family who did. As you might guess, the courts did not rule in favor of the New Hampshire parties. Allen joined the local militia movement and by force of his personality quickly became its leader. This informal militia initially called itself the “New Hampshire Men.” New Yorkers called them the “Bennington Mob” But after a newspaper labelled them the “Green Mountain Boys” the name stuck. The Green Mountain Boys served as an unofficial government and army for the region. They used violence and intimidation, not only against New York officials, but against anyone seen as collaborating with them. When a fellow landowner tried to sell New York land claims to some of his neighbors, as a way of ending any disputed ownership of their lands, Allen arrested the man and tried him. Found guilty, they sentenced the man to be tied to a chair all day in front of a local tavern. In 1771 locals held a convention in Bennington, where they attempted to organize the movement into more of a government. The Convention also published several pamphlets for reprint in newspapers, discussing the injustice of New York’s treatment of property owners. Later that year, several New Yorkers with New York claims to land, attempted to build homesteads on land already occupied under New Hampshire grants. The Green Mountain Boys forced them to leave at gunpoint, burning the homes they had begun to build. As the militia violence pushed the two sides closer to all out war, officials needed a leader who could broker an acceptable political solution for both sides. Instead, London appointed John Murray, the Earl of Dunmore as the new Governor of New York. 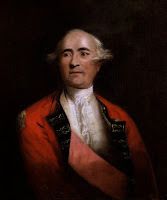 I’m going to talk about Lord Dunmore in more detail in a future episode. But Dunmore was a Scottish noble with a military background who was looking to make money in the colonies. He got off to a bad start with his Lt. Gov. by demanding Colden go halvsies with him on all the land patent fees that Colden had sold in the past year. Colden refused, and the two men were not able to work together. Dunmore, however, wasted no time issuing his own land patents and collecting the fees on those. He made no real effort to resolve the problems and in fact engaged in his own land speculation by buying some of the disputed lands issued by former governors. Dunmore did not last long, getting a promotion to Governor of Virginia where he would cause even more problems that I will discuss in a future episode. To replace Dunmore in New York, London transferred North Carolina Governor William Tryon, who we met back in Episode 35. As you may recall, Tryon had to put down his own colonial insurgency in North Carolina when the Regulators rose up to protest government corruption in tax collection. There, Tryon took a tough line, resulting in the Battle of Alamance, where he hanged the leaders and crushed the reform movement. Tryon decided he would use the same playbook in New York that he had used in North Carolina: make a large show of force, arrest and hang the leaders, and the movement will crumble. In 1771, Tryon declared Allen, Baker, Warner, and several others outlaws. In 1772 a New York raiding party attempted the arrest of militia leader Remember Baker. The surprise raid on Baker’s house led to intense fighting and several injuries. As the New York posse returned with its prisoner, a militia party under Seth Warner overtook them and recaptured Baker. Tryon was agreeable to working out a settlement. But this attempt was doomed from the start since tried to reach a compromise while he left Allen and the other leaders out of the deal. In the Governor’s opinion, these men were criminals and needed to be prosecuted. As he had done in North Carolina, Tryon offered no amnesty for the leaders and refused to deal with them. Instead, he reached out to moderates living in the area, who would get pardons. New York would not issue new claims and would not attempt to evict anyone while both parties attempted to resolve issues in London. Allen, who would have been hanged under this deal, made sure the locals rejected this offer. The standoff continued. Next, Tryon attempted to create a competing authority in the region by appointing local landowners to government offices. By doing so, he hoped to swing local support to his appointees and away from the Green Mountain Boys. To counter this, locals held another convention in Manchester, where they declared it a crime for any resident to accept a New York office, punishable by whipping or banishment. Tryon attempted to enlist the support of British regulars in Canada under the command of Gen. Haldimand. But Haldimand, remembering how Gen. Gage had been reprimanded for lending troops to New York in a land dispute against Connecticut a few years earlier, refused to get involved. 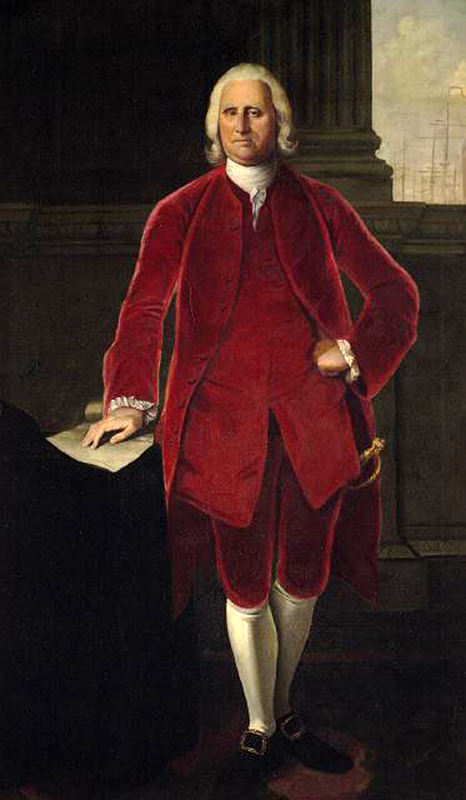 Tryon made his request for Regulars directly to the new Secretary of State, Lord Dartmouth. He got back a letter saying no, and that he really needed to resolve this by accommodating the claims of those with New Hampshire Grants and not to involve the military in this. This was all part of Dartmouth’s kinder gentler approach to resolving colonial disputes. In late 1772, the New Hampshire grant owners sent another delegation to London to seek official resolution of their disputes. The group was well received, but no officials were willing to make any decisions. As we will see in a future episode, by early 1773, they were more focused on other crises involving the East India Company and did not want to give much attention to some backwater colonial land dispute in New York, or New Hampshire, or wherever. The delegation did seem to spur Secretary of State Dartmouth to send a request to Gov. Tryon to return to London to discuss why he did not seem to be willing to resolve this matter peacefully. Before leaving though, in late 1773, the town of Clarendon grew with residents holding a rather shaky Massachusetts claim to the land. It seems that the group was really pro-New York but did not want to use New York claims that might get them in trouble with the Green Mountain Boys. They got in trouble anyway. Allen led a group of 100 armed men to the city to force residents to purchase New Hampshire claims. The residents fled to Albany rather than face down what they called the Bennington Mob. So before he left for London to convince Dartmouth that he could resolve these dispute peacefully, Governor Tryon used the Clarendon incident as justification to enact a new law in March 1774 similar to what he had used in North Carolina. The law authorized the Governor to order the arrest of anyone guilty of rioting. If the accused refused to surrender himself to authorities within 70 days, he would be deemed guilty and subject to immediate execution on sight. Tyron immediately named Allen and seven other leaders under the new law. In response, Allen and others informed the newspapers that they would execute anyone who tried to arrest them under this statute. Tryon, however, never raised a militia to do battle and force the issue. Shortly after passing the Riot law, Tryon left for London, where he would remain for a year. During that time, the fighting at Lexington and Concord put all other issues on the back burner. The day Tryon returned to New York in June 1775 was the same day George Washington passed through New York on his way to Boston to take command of the Continental Army. The two sides of this land dispute moved their fight into the Revolution. Most of the New York claimants were Tories who sided with the British government. 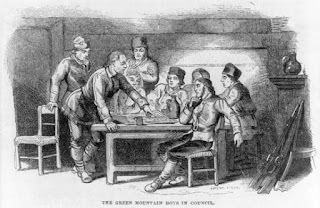 The Green Mountain Boys joined the Patriot movement almost immediately after Lexington, with their first major act to be invading New York and capturing Fort Ticonderoga. But that is a whole new topic for a future episode. Next week, London tries to tweak its tea import policies to bail out the failing East India Company, and at the same time break the colonial resistance to tariffs. Baker, Ray Stannard “Remember Baker” The New England Quarterly, pp. 595-628, 1931: http://www.jstor.org/stable/359581 (free to read online with registration). Vermont Historical Society Collections of the Vermont Historical Society, Vol. 1, Montpelier: J. & J.M. Poland Printers, 1870. This includes many useful primary documents as well as Ira Allen’s (Ethan Allen’s brother) History of Vermont. Batchellor, Albert S. (ed) & Huse, Hiram A. (ed), The New Hampshire grants, being transcripts of the charters of townships and minor grants of lands made by the provincial government of New Hampshire, within the present boundaries of the state of Vermont, from 1749 to 1764. With an appendix containing the petitions to King George the Third, in 1766, by the proprietors and settlers under the New Hampshire grants, and lists of the subscribers; also historical and bibliographical notes relative to the towns in Vermont, Concord: Edward N. Pearson, 1895. Chipman, Daniel Memoir of Colonel Seth Warner, Middlebury: L.W. Clark, 1848. Collins, Edward D. A History of Vermont, Boston: Ginn & Co. 1903. De Morgan, John The Hero of Ticonderoga or Ethan Allen and his Green Mountain Boys, Philadelphia: David Mckay 1896. Hall, Hiland The history of Vermont, from its discovery to its admission into the Union in 1791, Albany: Joel Munsell, 1868. Moore, Hugh Memoir of Col. Ethan Allen, Plattsburgh: O.R. Cook, 1834. Sparks, Jared American Biography, Vol. 9, Boston: Little and Brown, 1902 - Includes Life of Ethan Allen and Life of William Ellery. Thompson, Daniel P. The Green Mountain Boys, Boston: Benjamin Mussey & Co., 1853 (this is more of a fictionalized account of the events). Wilbur, La Fayette Early History of Vermont, Jericho, Vt: Roscoe Printing Co. 1899. Randall, Willard Sterne Ethan Allen: His Life and Times, New York: W.W. Norton & Co. 2011. Wren, Christopher S. Those Turbulent Sons of Freedom: Ethan Allen's Green Mountain Boys and the American Revolution, New York: Simon & Schuster, 2018.